1. Blend a little of the buttermilk in a shallow dish with the cornflour until smooth. Stir in the remaining buttermilk, the garlic, parsley, tarragon and 2 tbsp of the olive oil. 2. Remove the skin from the chicken thighs and score the skinned sides several times with a sharp knife. Add to the dish, turning the chicken in the buttermilk mixture. Cover and leave to marinate at room temperature for an hour or for several hours in the fridge. 3. Preheat the oven to 190°C, gas mark 5. Cut the fennel into quarters, lengthways, then cut each quarter into wedges. Cook in boiling water for 3 minutes to soften. Drain, return to the pan and add the remaining oil. Shake the pan well to coat the fennel in oil. 4. Turn the chicken in a roasting tin, skin-side up and scrape the remaining buttermilk mixture on top. 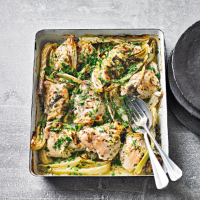 Arrange the fennel down the centre of the tin and bake for 1-1¼ hours or until the chicken and fennel are cooked through and golden. Scatter with extra parsley and serve with mashed potato and seasonal green vegetables. If roast potatoes are a Sunday tradition, then serve instead of mash. Tossing the potatoes in Cooks’ Ingredients Herby Zaatar towards the end of cooking makes a delicious flavour variation. This recipe was first published in Tue Feb 05 12:37:00 GMT 2019.